Discussion in 'SHH Community Forum' started by Edd Extraordinaire, Nov 12, 2005. Edit: It's Martin Riggs, I'm a moron. Somebody photoshop that photo to have Edd Extraordinaire on the ground with Danny Glover's gun aimed at his head. Or maybe you? Wait, that wouldn't be good because you'd probably wouldn't like that being done about you. 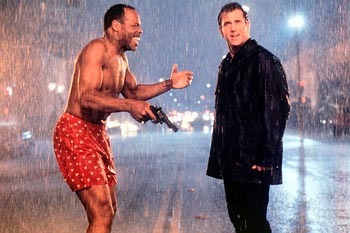 dude, i freakin LOVE the Lethal Weapon movies. Well, the first is the best...2 is great, not too big on 3, and 4 is so so, but even still Riggs and Murtaugh and teh best. I'm getting too damn old for this!! I never noticed that Danny Glover is in moderatley good shape there.